I did this race a few years ago and thought hey why not try it again and I’m glad I did, a new course which was super flat and nice to run. Grabbed a time of 42.12, which has me in a good mood! Also nice event afterwards for the kids to enjoy and play around Tramore. Okay I was warned that this would be hilly …. but boy was that race hilly. Enjoyable though and in a time of 33:54 I’m pretty happy with that. The runs are coming thick and fast these days and up today was the Portlaw 5 mile run. I must admit I’m not too sure about these shorter than 10km runs but then again I should be running for pace so 5 miles it is. This year the Portlaw run was on a new course and we had to walk a mile outside of the village to get to the top of a hill for the start line. It felt like I was being wound up, getting up the hill just to let it all out going back down again and sure enough once the horn went for the start I was off down that hill in a shot just like everyone else. I controlled the enthusiasm though I’ve had these quick starts before and it never works out in the long run. Down through Portlaw was fun and really only mile 3 caught me out a little. Hitting the 4 mile marker was funny as someone called for the time I yelled 26 mins and it reminded me that I was on track for my goal time so I went for it hell for leather in the last mile. That was fun as I left 4 people behind although they nearly all caught me on the line was maybe I went too early again! 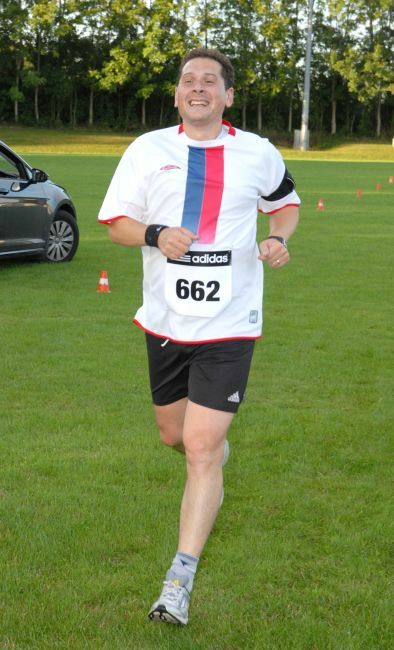 All was well at the end and I grabbed a time of 32:42 which was 1:16 quicker than I did l last year. Now I was super happy with that result. What a challenge, a run from Waterford to Tramore I just couldn’t pass off this opportunity to participate in such a long standing famous run in Waterford. This was a wet and windy day and certainty made the warm up session an important part of the race preparation. The Bolton Street car park was the perfect spot for such a warm up and I wasn’t the only one thinking along those lines as the car park was packed of runners in their pre-race routine. In fact I may overdone my time in the warm up area as I made my way to the start line on The Mall I was way back amongst the large crowd and it was tough going under starters orders as it was hard to gain a full race stride at the start. 2 miles into the run and the pace had settled down and I was in a good group of runners some of whom I recognised from previous runs so I knew I was on track. What surprised me most about the run out to Tramore was the up hill nature of the road I felt as though I was running up hills the whole time (which I hate). I pushed hard at the 5 mile mark but on reflection it was too early because the crew I was with caught and passed me too easily at the 6.5 mile mark and it wasn’t until I got into the last 0.5 mile that some streng came back for the finish line. In fact I was finishing even stronger when I heard Jonathan Brazil give a huge roar of encouragement near the end of the run. I had set a goal of 7 minute miles and I caught a time of 50:53 for the 7.5 miles which was 1 minute & 37 secs inside my goal time of 52:30 mins. I was hugely proud of achieving that goal. I’ve been running this race for the past 2 years, and I find it a nice one to finish off the season with. Given my recent injury from the last race I was unsure if I’d put in enough training for this last official run, but when morning came I felt good and the weather was fine too, so no excuses I had to be up for this run. There was a super crowd at the start location, but I grabbed a nice spot by the timing van, which meant that people had to file back towards the back of the starting pack once everyone was called to the line. Some lady, quite possibly the Major of Clonmel said a few words at the start which for the life of me I couldn’t hear and I was near the front !!!! Anyway under starts orders and as per usual the race started off at a great pace, but I really felt steady in the first few kilometres and in fact the incline at the Poppy Fields didn’t faze me at all, so it’s from here I knew I was up for this race. There’s a good bit of down hill and flat from this point so kept the steady pace up, until I came to the dreaded long up hill stint on the Marlfield Road ! Once again the mental block kicked in, I must find a way around this, but my pace dropped way off on this hill. Got over the crest and it still took me a little while to truly get back on pace and then I just got it stuck in my mind that there was some one right behind me, right off my shoulder and it drove me on. The last few km’s were great, I felt the pressure of someone behind me and I just didn’t want to be passed and so it proved to the line, the chap behind finished just 6 seconds behind. Overall I finished in a time of 43:24, which placed me in 12th place … holy crap I’m over the moon with that result, given there were over 270 runners/joggers/walkers. The time was 2:22 quicker than last year, which again I have to say I’m really happy with. Time to ramp down the training a little, take a break and aim for new start in December. The summer holidays in Devon, which were great by the way, stopped me from participating in the Rathgormack 5 Mile Race mid July, but I kept up the training runs over the break and I was back and ready for the 5th and final run of the summer series organised by the Carrick Roadrunners. This race was hyper-local given that it was in Piltown and even part of the course was on a regular training route of mine so I was excited and determined about running this race. More so determined as I bombed at this race last year and wanted to make up for that. On picking up my number at the registration desk I was greeted with a pleasent surprise as I was presented with a money off voucher for Outfield Sports (Carrick-on-Suir) given that I was about to complete 4 runs out of the 5 run series. I tucked that voucher away and made for the start line in Kildalton College, the number of participants seemed smaller but overall the start line was still crowded. On the off I was sure not to kill myself in the first part around the grounds of Kildalton, this is something I didn’t watch out for the year previous. Also I took note that the course was measured in miles so I have a better set of figures in my head now when it comes to my race pace in miles. I broke the first hill nicely and was well into my run by mile 3 and then we hit the Bog Road, my training patch. I needed a good strong pace on this stretch and found it. I was feeling good, really good and was well on my way to the finish line. Then in the final 500m there was a little hiccup a stumble and then I hear in the crowd, “Come on Miguel you’re nearly there”. A supporter, it was brillant, just what I needed to get that head up again and burst for the actual line. Once the race clock came into sight it was fantastic, just to see I was right on track for what I wanted to achieve and I stopped it at 42:21. This was a personnel best for 10km which I must say I am delighted with, makes me feel all the training runs over the summer break were worth it. 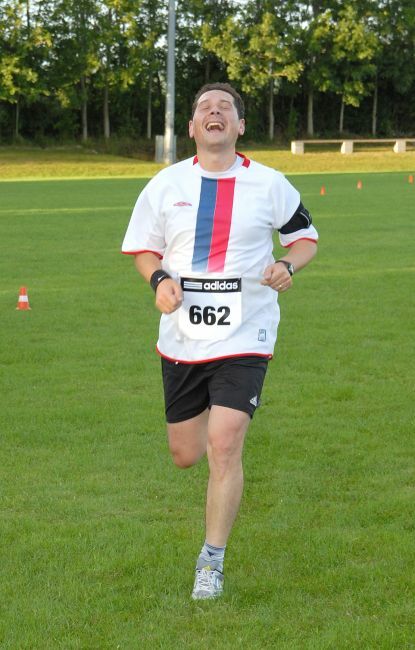 It seems the camera man at the finish line caught that feeling just right too. In flying form these days after a few quick races, so I entered the Stoneyford (Kilkenny) 10km with high hopes of bettering last years race. I arrived in Stoneyford in good time, and managed a decent warm up, although my only slight worry was the fact my left ankle has been acting up a little recently so I was trying my best to monitor it, in the warm runs. Due to the layout of the initial start line, which runs up the village main street and then back down again, I was determined to find a good starting position. I did and really the next thing to get clear in my mind was to pace myself from the start, which simply isn’t easy to do ! The first 1.5km was good, then I hit the long up hill stretch out of the village, I felt I was tipping along fine until the 40 min pace runner cam flying by me and then I knew two things, one I had started too quick again and two at the 3 km mark I was starting to slow from that early quick pace. I found my stride and took on the hills as best I could, I know I still have to do some training work in regards to hills, I’m just not achieving the right pace on them. There was a great down hill stint at the 6km mark, however the 7.5km mark hill that came up next was really tough ! There was a lady that passed me at this stage, but she was great in giving encouragement as she passed, which really helped as I pushed towards the end goal. The last stint of the run was super fast, mostly down hill, although there was one chap on a real flyer past me at this last stage, but never the less I was feeling good coming into the finishing line area. Beating 43:35 from last year was the target and as I looked at the big digital clock coming into the finish I was over the moon 42 something was on clock, I could do it, I could break it and sure enough from the official time sheet [pdf] I grabbed a time of 42:52. A full 40 secs better and not only that but broke the 44 minute mark, I was really, really happy with that run, not that the picture shows it !